This addon/edit basically adds an equipped weapon HUD to the Z-HUD. I've also added a background picture to the weapon HUD. You can enable/disable this feature and change the picture in the config area of the script. # -Added option to change order of the icons via config. # -Added option to change location of hotkeys/weapon HUD. # -Background images for weapon graphic can now be larger than 24x24. 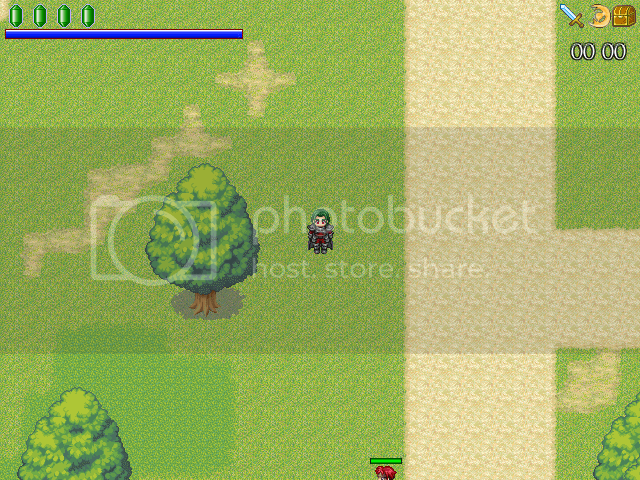 # -Adds the player's equipped weapon to the HUD. # -Displays a graphic for when no weapon is equipped. # -Instructions for editing the config are located in that section. # -Place this script right under Z-HUD and above main. # -Place all graphics in your game's pictures folder. # -Spread out icons to it doesn't look cluttered. # -Improve efficiency of the code. HUD_X = 632 #Horizontal location of HUD. #This is where the right side of the hud will be! #in order to set this properly. HUD_Y = 4 #Vertical location of HUD. # DO NOT EDIT ANYTHING BELOW UNLESS YOU KNOW WHAT YOU'RE DOING!!! # Draws the equipped weapon on the screen. # Draws the skill hotkey on the screen. # Draws the number of skills left to use. # Draws the item hotkey on the screen. # Draws the number of items left to use. # Tests and draws the equipment. # Sets up the area where the hotkey icons and equipped weapon will be drawn. Put the script below Blizz-ABS and BELOW the Z-HUD. Set DISABLE_WEAPON_BACK to false to allow a picture to be displayed behind the weapon graphic (set what picture will display in the script! ), or set to true to disable this picture. You also need to create an "empty weapon" file, which should be the same dimensions as the item and skill back pictures. Name it Weapon and place it in the pictures folder, or name it anything you want and edit the appropriate place in the script. It would be a fist or anything you want that will show when the player is unarmed. You can either make your own, or use this one. I got this graphic from http://www.pixeljoint.com/files/icons/full/34x34icons.png Place all graphics in your game's pictures folder! Requires Blizz ABS and Z-HUD to work. Any other script that modifies the Z-HUD may not be compatible. Works with the Quick weapon switch addon by Blizzard perfectly. I kind of just did this version and didn't test it yet...if anyone has a problem, please let me know! That key term doesn't exist. Please make sure you are using only key terms that exist. Thank you. Now your topic can be moved into the database and will appear in the database index. I looked through again...and I realized that an error will appear if you try to use an item. I originally edited the different parts of Blizz-ABS directly which made it work. I then put my edits into a separate script and posted it here to make it convenient for others. # Checks whether a item should be executed or not. I'll edit the script and add another spoiler for the code. I'm new to scripting, so I'm not completely sure how to get all of this to work how I originally had it in the script. Actually you don't have to do that. You can simply add that part in your script and if it is put below Blizz-ABS and Z-HUD (which it should since it's a plugin for both), it will simply override the original code. Doing that still gets the same error. I don't remember seeing this before taking my edits and putting it into this script. I'm trying to look into this. Change in the error giving line item_number to $game_party.item_number. Great! I'll try it out. So what do I need to name the Equip hotkey background? Great work btw, I would have to do this myself for TES, and go through the painfull process of learning ruby and finding out what I need to do with blizz abs, but now I dont have to =D Thanks! The "draw_equip" method has no way to compensate for no weapon equipped. I never noticed that problem before, but I'll post up an updated version soon! The background is simply the icon of the weapon you have equipped. To be safe, I would name the icon graphic the same as the weapon name in the database. -The no weapon problem has now been fixed. -You need to specify a graphic for the "Weapon Back", similar to the skill and item backs. Simply make an image the same size as the other backs, save it in your pictures folder as "Weapon", and you're done! It should be preferably empty since it won't show up on screen anyway. I had to do this so that the bitmap can always draw itself without relying on the player's equipped weapon since he/she may not always have one. As long as you have it set right in the editor, it will get the right graphic. I also just noticed that I made the error in my above post by using "wpn.name". Yeah, I took that and placed it right into my code, and I still got errors. EDIT: I'll leave it the way it is for now, since it works, but if I can get the code to work without needing that graphic, I'll post it as another update. I can say with pretty much 100% certainty that the error is not in that method.